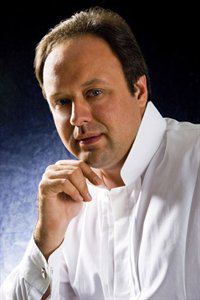 Russian pianist Alexander Ghindin (b. 1977) graduated from Moscow State P.I. Tchaikovsky Conservatory after completing master class studies with Professor M.S. Voskrensky in 2001. By the age of 13, he had won the Moscow Young Pianists' Competition. One year later, in 1994, Ghindin won the 10th International Tchaikovsky Competition, becoming the youngest-ever winner at age 14. In 1999, he earned second prize at the Brussels International Reine Elisabeth Competition. That same year, he joined the Moscow State Philharmonic as a soloist. He has performed in his native Russia, as well as in Europe and Japan. In 2007, Ghindin won first prize at the Cleveland International Piano Competition.